Spanish is a very useful language to learn as it is the world’s second most popular language. Outside of the popular coastal tourist resorts a basic knowledge of Spanish is invaluable. Even in the tourist resorts you will find the Spanish will not go out of their way to speak English to you. If you try a few words and get stuck you tend to find they suddenly can speak a bit of English! The bottom line is that if you are moving to Spain and looking for work you might as well not bother if you don’t learn the language. If you are a tourist then obviously you don’t have to learn the language, you will get by, but learning a few basic words or expressions will actually add to the enjoyment of your holiday as you delight the locals (and yourself). I don’t think it is fair to describe learning any language as easy but if it’s any consolation, there are hundreds of English words that are virtually identical in Spanish – so you already know a lot of Spanish vocabulary! To integrate and survive in Spain you have to invest a small amount of money (and time) and learn the basics of the language. Over time this will pay dividends as you change your life direction for the best. 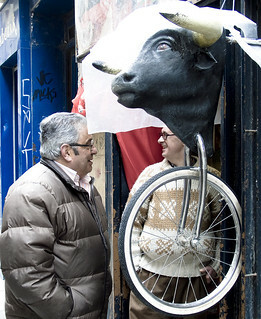 You will feel part of Spain and it’s culture as opposed to feeling like an outsider. You will meet beautiful women or handsome men or just make new friends, the possibilities are endless once you master the language. If you want to get a job in Spain you simply must learn the basics of the language as a minimum. We recommend the Spanish learning package – see the book cover to the right – most of the information on this page has been kindly provided by the authors of this book. They are so confident of their product they back it up with a 100% money-back guarantee. * Get motivated. The best way to do this is to imagine your ideal outcome. If you don’t do this you will most likely fail when you start hitting a few inevitable hurdles. We all go though this stage but if you have burned into your mind the positive results that will follow then you will succeed where thousands have failed. Imagine something like getting a job in your dream destination or having a relationship with a handsome Spaniard or meeting a pretty Senorita! * Take baby steps to build your confidence. Remember that the first objective is to master a few basic words like hello, goodbye, thank you etc. This will give you confidence to go forward – DO NOT start learning long and complex words. * Buy a good book or better still a good tape series where you can hear the language and how it sounds. Obviously you need to buy this but there are books that you will waste months on and get nowhere and there are books where you will start to be able to speak and learn Spanish very quickly. * Don’t be afraid. Fear is a terrible emotion. You have to try and speak Spanish to people otherwise you won’t know how you are progressing. It really doesn’t matter that you will make mistakes, it is only by making mistakes that you will learn. The worst that can happen is that the person who are talking to will not understand you, yes it’s frustrating but don’t beat yourself up about it. * Go to Spain. Visiting Spain itself is a great motivator to learn the language. If you don’t keep practising what you have learned then you will be surprised at how quickly it is forgotten. * As much as you want to learn Spanish, there must be other people who are equally keen to learn English – place an ad and try finding someone who you can trade with. * Spanish grammar is different to English – leave it at that. Don’t keep trying to make sense of it in English terms – just concentrate on being able to communicate with people – otherwise you will end up confusing yourself. * There may be thousands of Spanish words but you only need to learn a fraction of them. If you analysed your own vocabulary during the day you would be surprised to find that you are not speaking like a dictionary but instead use a very limited amount of words. Spanish is the same, you just need to know the most commonly used words. * Turn wasted time into valuable time. Learning Spanish is great when you are doing things like driving, jogging, waiting for someone, ironing, cooking the dinner etc. The more time you practice the quicker you will accelerate your learning. Are you interested in learning Spanish or another language other than English? If you are, all you need to do is to learn how to use memory techniques. Learning another language for most people is hard, but this is just what you’ll hear from those people who haven’t tried learning yet. Instead, try asking those who were able to learn and successfully apply their second language to their normal daily lives. The truth is, learning a foreign language is not as difficult as you thought it was. Instead, learning strengthens your memorization skills. So, if you want to have your brain cells function at their optimum level, start learning new Spanish words or other foreign languages to say the least…Vamo nos! However, before you go into the battlefield of strange words and completely bizarre world of language, arm yourself with patience, high interest and willingness, plus the positive attitude to accomplish your purpose. We already mentioned from the beginning of this article that learning a foreign language associates to the wellness of a person’s memory skills. There are in fact ways on how to learn a foreign language easily and it’s by using the Link-Word Technique. To use this technique, one word from the Spanish language for example is associated or linked to an image and to another word in English. Let’s use the word Mantequilla in Spanish as an example. In English, mantequilla means butter. How is a beginner able to remember this word easily? You guessed it, by using the Link-Word Technique we can construct a scenario to interpret it in English in the most outrageous way possible. Picture a man entering a bar with a wide sombrero and a big stomach, he then orders 20 glasses of tequila and drinks them one at a time – straight. But, for this Señor, instead of putting salt on his tequila glasses, he asked for big bars of butter to complete his drinking frenzy! Simple isn’t it? This technique since it involves visual imagination makes the memorization easier for the student and learning Spanish or even other foreign languages makes it more interesting. What is the fastest way to learn Spanish? What is the fastest way to learn any language at all in a world full of fast-paced people? These questions immediately lead you to answers you want to know. The Internet is a one-point access you can use to discover new things and it’s also one source for everything you want to learn. Thousands of articles and products nowadays about learning other language programs are available via the internet. But what is it really that you want to know? One example of learning easy Spanish or any other language for that matter is the method formalized by Dr. Michael Gruneborg. An example would be how to remember a Spanish word while linking it with a picture or a scene and then associating it as well to its English version. In this case, let’s use the word slow from the English language, which is translated to atrasado in Spanish. The way how you can easily memorize this is to picture a man walking in a slow pace but then trips on an atlas-race-dog miniature. Can you imagine how that looks like? Funny isn’t it? There are no tricks in this type of memorization. The example sentence clearly wants you to remember the scene and the key words which are slow and atrasado. Placing the two words in one sentence and scenario as you co-relate them together, helps a learner to retain the information. It does not need to be perfect as your mind will remember what letters are missing. Spanish courses are available everywhere. Most people still learn Spanish as a second language from a university or college to earn a certification as well. There are many benefits to how learning Spanish can help you. There are always others who are interested in learning Spanish, but would like to learn inexpensively. If you want to help, you can teach them what you have learned. Another way is you can learn from available internet language software programs. You just have to trust your source though, with the tight competition online, there are already many websites willing enough to give away learning Spanish techniques. You need to research first before you make your choice. But why are so many people willing to learn the Spanish language as a second language? There are too many people already talking in Spanish, why not stick to English? It’s not a matter of competition, which language wins by a majority basis. The advantages are credited to you, the student. There are just too many reasons, each depends on your current situation why Spanish suddenly interests your will. Here are the facts: Spanish is now officially considered as the second world language as a vehicle of international communication. It only ranks third as the international language for politics, economics and culture. On top of that, Spanish is also the official language of 21 countries and is spoken approximately by a 100 million speakers as a second language. Whether you know this already or not, learning Spanish is not just a trend happening today, especially in the internet. It’s learning a language that is spoken by many people around the globe and officially recognized in many countries. You can start familiarizing yourself with Spanish words. Memorizing it also won’t be a problem at all. Try to picture a bee making honey on a mile wide honeycomb. The Spanish word for honey is used in the sentence as the word “mile”, to incorporate the idea with the English translation. From this example alone, a person learning the Spanish language makes it a lot easier to remember the words because the brain’s attention is focused on what’s silly and funny. Pick another Spanish word with the English translation, and then plot them the same way as the example above. You can start learning Spanish on your own and improve your memory as a bonus! I am just writing to let you be aware of what a superb experience our princess obtained checking your web site. She figured out so many things, including how it is like to possess an amazing helping mindset to get other folks really easily completely grasp several extremely tough subject areas. You actually exceeded our own expected results. Thanks for producing such insightful, safe, revealing as well as easy guidance on this topic to Sandra. What about learning Catalan? Outside the most tourist bit of Barcelona, even most of the supermarket products not to mention everything else is in Catalan. I speak some Spanish and people in Catalonia of course do, but increasingly they are preferring to communicate in Catalan. Who else finds this in the area of Valencia and north?